The Maxxis Carnivore is the culmination of years of engineering, R&D and testing to find a truly inspiring UTV tire that takes light truck influences and pairs them with the specs and abilities necessary for today's UTVs. 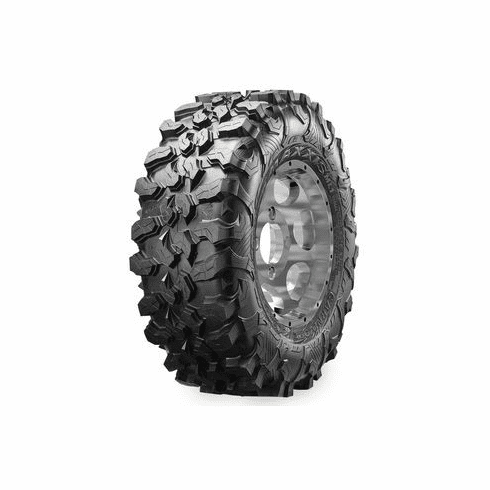 As is necessary for any UTV hardpack tire, the Carnivore is an 8ply design which means it is going to hold up to the puncture risks inherent with the western terrain. What makes the Carnivore so special however, is the specialized rubber compound developed by Maxxis, which provides better traction and control on rocks, ruts, roots and other geography you typically find in the desert. The Carnivore tread pattern also makes this tire as formidable on road as it is off. The lug size and spacing allows are what give this tire its versatility. The tightness of the tread pattern also provide this tire with excellent tread wear, prolonging the life of the tire.